If you're looking for a quick and hearty breakfast option, this classic dish will be right up your alley. 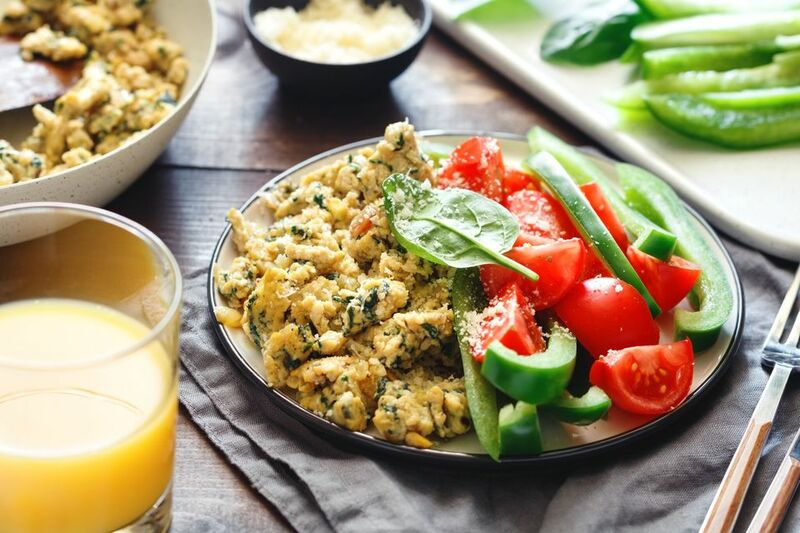 With a variety of ways to customize these eggs, and ready in only minutes, this dish is great for either one person or a whole family. Serve this recipe with some crisp bacon or sausages, orange juice, fresh fruit, and hot coffee and cold milk for a wonderful breakfast. Coarsely chop the baby spinach leaves. Heat the olive oil in a large heavy skillet and cook the onion and garlic until crisp-tender, about 5 minutes, stirring frequently. Add the chopped spinach to the skillet and cook, stirring often, until the spinach is tender, about 5 to 7 minutes. Be sure to cook this until the water that leaches out of the spinach has evaporated. In a medium bowl, beat the heavy cream with the eggs, salt, pepper, and thyme until foamy. Add the egg mixture to the skillet and cook and stir so the eggs scramble with the spinach, about 4 to 5 minutes longer. Sprinkle with the cheese and serve. If using frozen spinach, just thaw the frozen spinach under warm running water or in the microwave oven, and drain it very well. Frozen spinach holds a great deal of water; if it isn't properly drained, your recipes using it will be waterlogged. Chop the frozen spinach slightly. Add the frozen spinach to the eggs after they are scrambled, and just heat through. Serve immediately. You can use frozen chopped spinach instead of the fresh baby spinach leaves if you'd like, or if that's what you have on hand. The recipe can also be made with other greens. Chopped kale or mustard greens would be delicious, but they are quite strong-tasting. You could also add different herbs to this recipe. Some fresh basil and fresh chopped parsley would be very good. Some grated or shredded Colby, Pepper Jack, or provolone cheese would also be great with these eggs.